What do you think it would be like to live in Turkey? Yes, there is a country named Turkey and it's not filled with the turkeys that we eat during the holidays. Really! 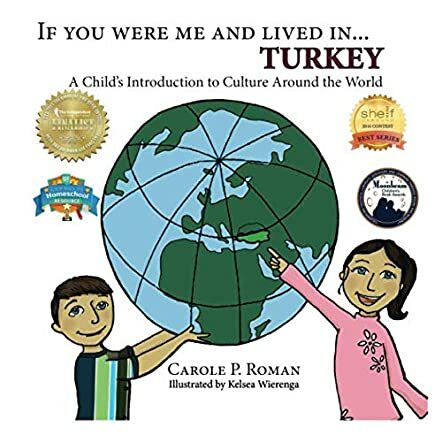 Children will love to read the beautifully illustrated book, If You Were Me and Lived in... Turkey: A Child's Introduction to Culture Around the World (Volume 6) by Carole P. Roman. In this book, children will learn everything related to the country of Turkey. This book has everything that your child needs to learn all about Turkey - from a glossary, history, culture and foods to names that are special to Turkey. Here are some names that are special to Turkey: borek, a pastry filled with meat, cheese or potato; doner kebab, marinated lamb; and a doll known as a bebek. There is so much to learn and explore in this book that your child will thank you for it. Author Carole P. Roman does an excellent job in her children's educational book series of providing education on various countries, cultures, and historical places from the Mayan Empire, Italy and Israel to Kenya, and this book doesn't disappoint. Every book that Roman creates is educational and insightful. Her books take the young reader to another place and time. As your child reads, they get a chance to sit back, dream, and wonder how life would be if they lived in __________ (you fill in the blank). Purchase this book and help to make it one of your child’s favorite stories. They will become so excited that they'll share it with their friends, as well as learning a lot about Turkey.